To humans, a coral reef may seem like a vast expanse of calm and serenity. Yet for its myriad inhabitants, this aquatic environment can be an unforgiving realm where the rule is “eat or be eaten.” For many reef dwellers, danger lurks at every turn, and there is a constant need to remain vigilant and escape predation. To survive, marine creatures have developed a myriad of different anti-predation tactics. For some, a speedy escape is the answer. Schooling fish find safety in numbers and confuse a would-be attacker with misdirection such as eyespots or stripes, crustaceans armor up, and all manner of critters use color to blend in and hide. All of these defensive strategies are used by the various marine animals found on the reefs of Wakatobi, and there’s more. To avoid becoming dinner, a number of otherwise defenseless reef dwellers have adapted unconventional tactics such as poisonous darts, venomous spines and chemical warfare. Divers learn early on that touching corals is a no-no. But not only is this bad form, it could be painful, as some corals have a built-in defense mechanism that can create a sting. Corals are cnidarians, a group of invertebrates that also includes hydroids, jellyfish and sea anemones and black corals. All of these organisms possess microscopic stinging organelles called nematocysts. 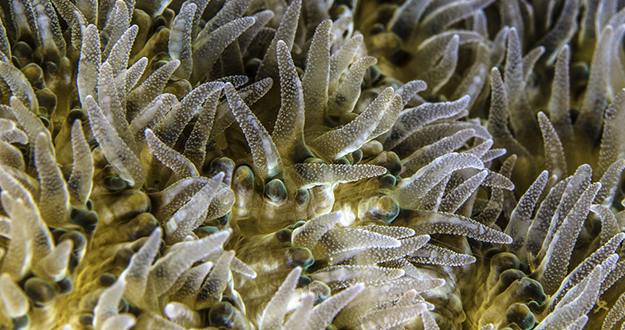 Microscopic stinging cell filaments are located in the tentacles of a coral’s polyp. In corals, the microscopic stinging cell filaments (nematocysts) are located in the tentacles of the polyp. These nematocysts are fired like mini harpoons, with each dart injecting a small amount of painful toxin into the victim. This is one more reason why divers should take care not to touch corals, as they may earn themselves a sting. The tiny harpoons remain attached to the coral by equally diminutive filaments. When used to capture prey rather than provide defense, these filaments serve to ensnare the victim so it can be brought to the polyp mouth. Another defensive technique that is a favorite with slower-moving marine animals is to muster an arsenal of poisonous spines. One of the more spectacular examples of this tactic is the common lionfish, which is one of the most beautiful fish on the reef. This fish’s vividly contrasting coloration warns predators away from its highly venomous spines. 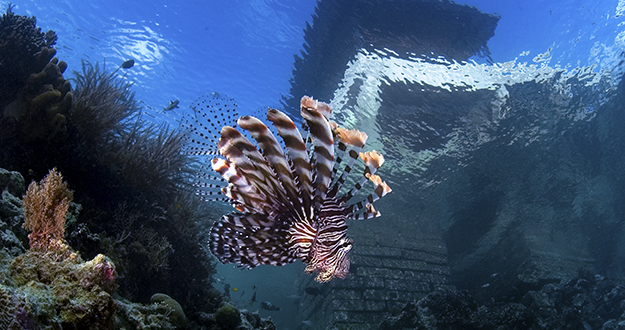 Lionfish may be the most flamboyant fish to arm themselves with poison-tipped spikes, but there are many more members of the Scorpaenidae family that employ similar tactics. This includes the Scorpionfishes and stonefishes. Most species in this large family are well camouflaged by flaps, tassels, and coloration matching the bottom terrain. 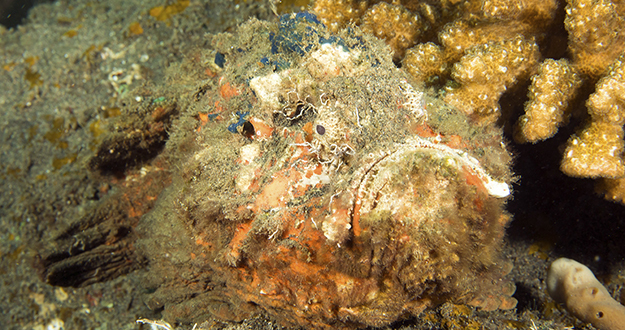 They are all venomous to a greater or lesser extent, with the stonefish being the most poisonous. They secrete potent neurotoxins from glands at the base of their needle-like dorsal fin spines, which stick up when disturbed or threaten. This creates a very effective defense when the fish are attacked from above. Instead of sprouting external arsenals of spikes and stingers for defense, certain marine animals internalize their toxic talents. This a strategy used by nudibranchs. Lacking in any type of protective shell, and unable to escape even the slowest of predators, some of these sea slugs choose to eat poison. This tactic is employed by members of the sponge-eating droid group, which ingest and concentrate the sponge’s natural chemical defenses into their own flesh, thereby rendering themselves distasteful to predators. One taste of the lovely Hypselodoris Bullocki is usually sufficient to teach a predator that it is a bitter mouthful to covet. 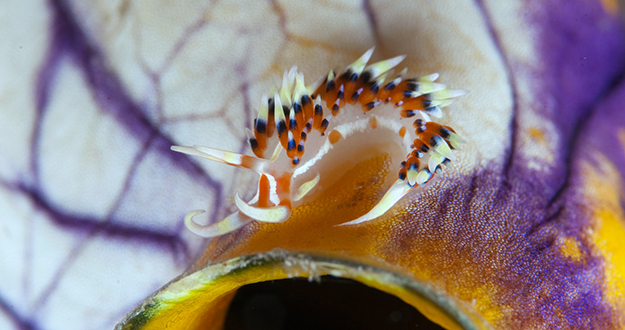 Toxic snacking isn’t the only way nudibranchs develop chemical defenses. Certain species are able to produce their own deterrents, including a dose of sulphuric acid, which can be excreted by the skin then the animal is touched. Not all nudibranchs are toxic, but some that aren’t have evolved to mimic the colorations and skin patterns of those that are. These imposters are using a tactic that biologists call Müllerian mimicry. Pufferfish are best known for their ability to turn themselves into spine-covered balls when threatened. This inflationary tactic will deter most attackers from trying to bite and swallow, but it’s just the puffer’s first line of defense. A predator that is “lucky” enough to catch the puffer suddenly or a large-jawed fish that decides it can handle a puffed-up puffer will find its mouth full of a highly toxic substance called ‘tetrodotoxin,’ making puffers an unpleasant, often lethal, choice of prey. This neurotoxin is found primarily in the puffer’s ovaries and liver, although smaller amounts exist in the intestines and skin, as well as trace amounts in muscle. It does not always have a deadly effect on the larger predators, such as sharks, but it can kill humans. And if that’s not enough for protection, some puffers have sharp, erectable spines and they have sharp teeth that can take a painful bite out of their attacker. 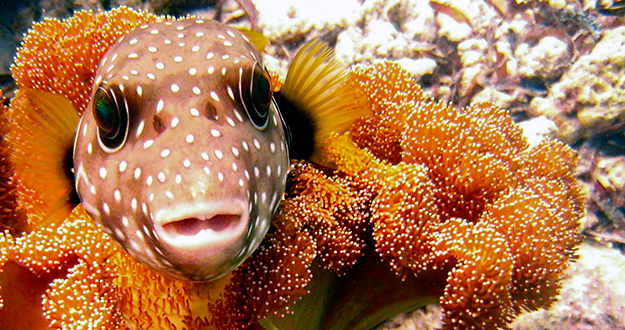 With this triple whammy, pufferfish certainly make up for their slow swimming and seemingly docile nature. These are just a sampling of the many quirky and fascinating characters that fish watchers and photographers can discover on the reefs of Wakatobi. 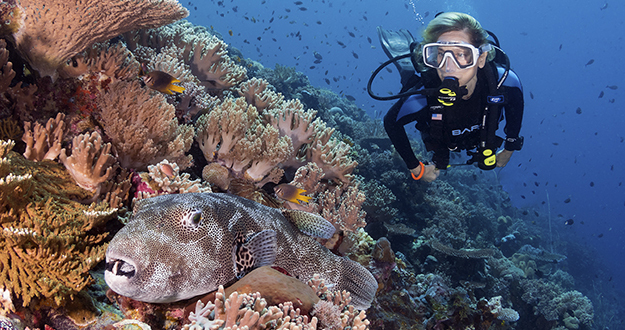 To meet them face-to-face, and enjoy some of the most pristine and bio-diverse dive and snorkel sites on earth, contact us at office@wakatobi.com or complete a quick trip inquiry at wakatobi.com. Visit us on Facebook or Instagram.